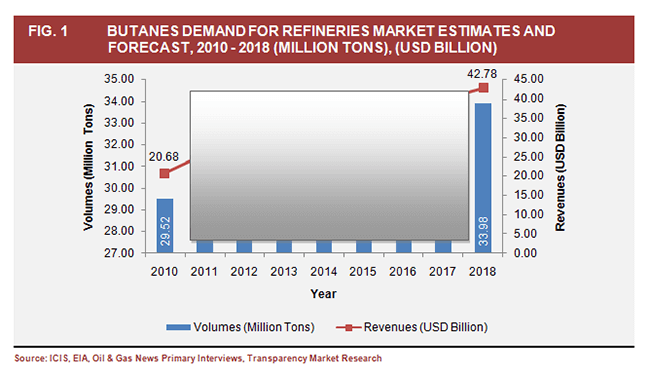 According to “Butanes Market - Global Industry Size, Market Share, Trends, Analysis, And Forecasts 2010 - 2018”, a new report published by Transparency Market Research (TMR), the global butane market is estimated to reach US$282.59 billion by the end of 2018, growing from US$167.04 billion back in 2011. The report states that the butanes market will expand at a CAGR of 8.9% in terms of revenue from 2013 to 2018. The market is also estimated to grow in terms of volume from 201.26 million tons in 2011 to 236.45 million tons by 2018, registering growth at a CAGR of 2.46% during the forecast period. Butanes are primarily used in liquefied petroleum gas (LPG). The demand for butane is directly proportional to the rise in demand for LPG, since two-thirds of the butane produced globally is used in LPG. Presently there are many factors driving the global market for butanes. According to the report, the surging demand for LPG as a domestic fuel in commercial and residential sectors is the major factor attributed to the growth of the global butanes market. The market demand for butane is also fueled by the growing ethylene capacity in the Middle East, since butane is also used as petrochemical feedstock required for producing ethylene and other derivatives. However, fluctuations in the volatile crude oil market and growing regulatory issues owing to environmental concerns have appeared as major hindrances limiting the growth of butanes market. The rising demand for LPG witnessed by Asia Pacific countries such as China, India, and others provide great opportunities for butane producers. They can set up their SBUs in Asia Pacific and capitalize on the market opportunities and increasing demand registered by the region. Among the many applications of butanes, LPG accounted for a whopping 66.1% of the butane produced globally in 2011. LPG has also emerged as the fastest growing application for butanes, registering growth at a CAGR of 2.58% during the forecast period. LPG is primarily used as a heating and cooking fuel in residential and commercial sectors and this segment represents 49% of the overall global demand for LPG. Butanes are also used as blending agents in refineries and feedstock for producing various petrochemicals. According to the report published by TMR, Asia Pacific dominates the market for butanes, accounting for almost 29.6% of the global demand in 2011. The region is closely followed by the Middle East and North Africa (MENA) region, North America, and Europe. By far, Asia Pacific and the Middle East have registered maximum demand for butanes. Among the leading participants operating in the global market for butanes, Royal Dutch Shell (The Netherlands), Chevron (U.S.), Sinopec (China), British Petroleum (U.K.), Conoco Phillips (U.S.) and Exxon Mobil (U.S.) are the most prominent names. The study by TMR presents a comprehensive assessment of the global butanes market. Apart from revealing facts and figures pertaining to growth and prospects of the butanes market in terms of revenue and volume, the report also provides an in-depth analysis of the sales and trends experienced by the market. It has been designed specifically toestimate and analyze the global demand and overall performance of the butanes market.